St Saviour's church was built to serve a district of dense back-to-back housing interspersed with heavy industry. It closed when the area was redeveloped after the Second World War. A drawing of the church from a leaflet appealing for funds for the new church appears on the Church Plans Online website. 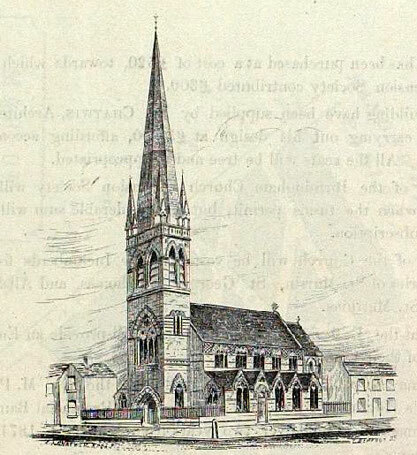 This church appears on the 1890 Ordnance Survey map which can be viewed at British History Online - http://www.british-history.ac.uk/mapsheet.aspx?compid=55193&sheetid=10087&ox=4675&oy=1100&zm=1&czm=1&x=503&y=234. St Saviour's was designed by J A Chatwin and built of brick in Gothic style with apsidal chancel, nave, aisles, and west tower with spire. It was consecrated in 1874. A parish was assigned out of that of St Matthias'. The church closed in 1962.